Arnald of Brussels, compiler. Alchemical writings in Latin, Italian and Catalan. 15th-century manuscript on paper, written mostly in Naples between 1472 and 1490. This alchemical manuscript written by Arnald of Brussels has been described as the most important in Lehigh's collection. It was acquired by Lehigh in 1881 as its first manuscript; however, it was not properly identified until 1933. While cataloging Lehigh's manuscripts for the Census, W. J. Wilson recognized its author. Arnald of Brussels was a late 15th-century scribe, printer, and amateur scientist, whose work is preserved in a number of other manuscripts. The Lehigh manuscript was never published, nor ever intended for publication. It contains tracts that were of particular interest to Arnald, including writings by Llull, Geber, Albertus Magnus, and Arnald of Villanova. 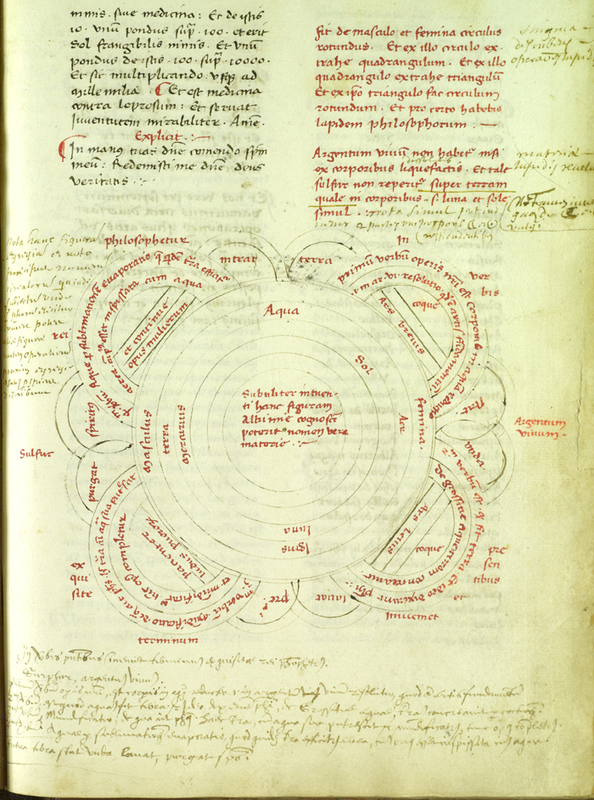 Shown is a complicated diagram that purports to reveal “the secret of the philosopher's stone,” the substance which alchemists sought in order to transform base metals into gold or silver. The Latin inscription in the center of the circle reads: To one gazing subtly at this figure of alchemy, it will be possible to recognize the name of the true matter. Moving out from the center, the third ring has the alchemical representations for gold, the sun, silver, the moon, and mercury. Around these are placed, in the next ring, the four elements: water at the top and then clockwise air, fire, earth. Finally the outer ring locates the feminine and masculine sides of the diagram. The four large and eight small semicircles around this “round circular figure” (as the table of contents describes it) contain directions for the separation of the stone from the four elements in four complicated and obscure stages. The whole is further complicated by the rubric in the upper right-hand corner of the folio, which reads in part: There is made from the masculine and the feminine a round circle. And from that circle extract a square. And from that square extract a triangle. And from this triangle extract a round circle. And for certain you will have the philosopher's stone. The purpose of the diagram, then, is to illustrate the relationships among these largely Llullian concepts and to make clear the basic structure of matter.